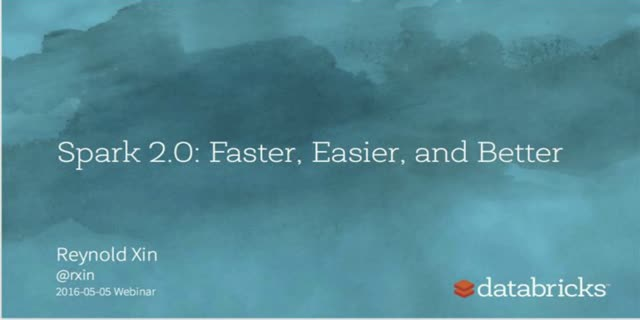 In this webcast, Reynold Xin from Databricks will be speaking about Apache Spark's new 2.0 major release. - Structured Streaming: Simplify streaming by building continuous applications on top of DataFrames allow us to unify streaming, interactive, and batch queries. ML development brings many new complexities beyond the traditional software development lifecycle. Unlike in traditional software development, ML developers want to try multiple algorithms, tools and parameters to get the best results, and they need to track this information to reproduce work. In addition, developers need to use many distinct systems to productionize models. To address these problems, many companies are building custom “ML platforms” that automate this lifecycle, but even these platforms are limited to a few supported algorithms and to each company’s internal infrastructure. In our webinar, we will present MLflow, a new open source project from Databricks that aims to design an open ML platform where organizations can use any ML library and development tool of their choice to reliably build and share ML applications. MLflow introduces simple abstractions to package reproducible projects, track results, and encapsulate models that can be used with many existing tools, accelerating the ML lifecycle for organizations of any size. HP has invested into a new product delivery paradigm called Device as a Service (DaaS). Success of the DaaS investment depends on automating the delivery, monitoring, replacement, user interaction, and servicing of the device. At the core of DaaS is a set of Virtual Assistants optimizing the cost and the use experience assuring customer satisfaction with an aggressive cost model. Key takeaways from this presentation is how HP is using the Databricks Unified Analytics Platform to develop Virtual Assistants to change the workplace. Additionally, John will cover HP's approach to developing AI on Apache Spark™ and why HP chose Spark as a core technology for AI. Deep Learning has shown tremendous success, and as we all know, the more data the better the models. However, we eventually hit a bottleneck on how much data we can process on a single machine. This necessitates a new way of training neural networks: in a distributed manner. Real time analytics are crucial to many use cases. Apache Spark™ provides the framework and high volume analytics to provide answers from your streaming data. Join us in this webinar and see a demonstration of how to build IoT and Clickstream Analytics Notebooks in Azure Databricks. These Notebooks will use Python and SQL code to capture data from Azure Events Hub and Azure IoT Hub, parse the data, and make it available to run in machine learning models. See how your organization can start taking advantage of your streaming data. With GDPR enforcement rapidly approaching on May 25, many companies are still trying to figure out how to comply with one of the regulation’s biggest pain points - data subject requests (DSRs). Under GDPR, data subjects (individuals) in the EU have the right to request information on what personal data is collected, how it is being used, and to have that data changed or erased. For many organizations that rely on data lakes to store their big data, sifting through millions of files to locate and modify records for a DSR is at minimum a massive effort. And trying to do this within prescribed timelines is near impossible. Fortunately there’s a path forward. Through an optimized approach to data management, Databricks powered by Apache Spark™ makes it easy to quickly find, edit and erase data submerged deep within your data lake without disrupting your data pipelines. Sandy is going to highlight some key aspects of the new Spark-as-a-Service offering in Azure, from Databricks. Leveraging the power of Databricks notebooks to showcase loading and cleaning data in SQL and Scala, exploration and all the way through to having a model into production. Azure Databricks in an Apache Spark™ based platform, providing the scale, collaborative platform, and integration with your Azure environment that makes it the best place to run your ML and AI workloads on Azure. This webinar will include an in-depth demo of key AI and ML use cases. With 170+ global networks, Viacom is focused on providing an amazing audience experience to its billions of viewers around the world. Core to this strategy is leveraging big data and advanced analytics to offer the right content to the right audience and deliver it flawlessly on any device. To make this possible, Viacom set-out to build a real-time, scalable data analytics platform on Apache Spark™. Join this webinar to learn how Viacom overcame the complexities of Spark with Databricks and AWS to build an end-to-end scalable self-service insights platform that delivers on a wide range of analytics use cases. Learn the basics of Apache Spark™ on Azure Databricks. Designed by Databricks, in collaboration with Microsoft, Azure Databricks combines the best of Databricks and Azure to help customers accelerate innovation with one-click set up, streamlined workflows and an interactive workspace that enables collaboration between data scientists, data engineers, and business analysts. · RDDs, DataFrames, Datasets, and other fundamentals of Apache Spark. · How to quickly setup Azure Databricks, relieving you of DataOps duties. · How to use the Databricks interactive notebooks, which provide a collaborative space for your entire analytics team, and how you can schedule notebooks, immediately putting your work into production. Building multiple ETL pipelines is very complex and time consuming, making it a very expensive endeavor. As the number of data sources and the volume of the data increases, the ETL time also increases, negatively impacting when an enterprise can derive value from the data. Join Prakash Chockalingam, Product Manager and data engineering expert at Databricks, to learn how to avoid the common pitfalls of data engineering and how the Databricks Unified Analytics Platform can ensure performance and reliability at scale to lower total cost of ownership (TCO). - Unify data engineering and data science to accelerate innovation for the business. - A collaborative workspace to experiment with models and datasets, and then put jobs into action instantly. - An automated infrastructure that enables you to autoscale compute and storage independently. The live demo portion of the webinar will show how Azure Databricks can bring in streaming data, run it in a machine learning model, and then output the results to PowerBI for visualization. The upcoming Spark 2.3 release marks a big step forward in speed, unification, and API support. - New DataSource APIs that enable developers to more easily read and write data for Continuous Processing in Structured Streaming. - PySpark support for vectorization, giving Python developers the ability to run native Python code fast. - Improved performance by taking advantage of NVMe SSDs. - Native Kubernetes support, marrying the best of container orchestration and distributed data processing. Enterprise data science teams are driving big innovations in machine learning, but this has put them under increased pressure to deliver more models, more frequently, and more rapidly. In this webinar, Forrester VP & Principal Analyst, Mike Gualtieri, will share data on the top trends in machine learning and lay out what data science teams need to do in order to maximize their output. -Create a one-to-one personalized shopping experience. -Decrease cost of moving models to production by nearly 50%. -Stand up new models 5x faster than before. iPass is the world’s largest wifi network serving over 160 network providers with nearly 60+ million hotspots in airports, hotels, airplanes, and public spaces in 120 countries across the globe. Analyzing the state of the world’s wifi in real time is a daunting task fraught with unpredictable challenges that can impact performance, reliability, and security. Join this webinar to learn why iPass moved from an on-premises Hadoop system to Databricks in the cloud and how they are able to deliver ground-breaking results with a small and nimble team. -monitor the performance of millions of wifi hotspots around world. -leverage machine learning and real-time analytics to understand the health of access points. -make recommendations to customers on the best access point to use to ensure optimal performance. Continuous integration and continuous delivery (CI/CD) enables an organization to rapidly iterate on software changes while maintaining stability, performance, and security. Many organizations have adopted various tools to follow the best practices around CI/CD to improve developer productivity, code quality, and software delivery. However, following the best practices of CI/CD is still challenging for many big data teams. *Key challenges in building a data pipeline for CI/CD. *Key integration points in a data pipeline's CI/CD cycle. *How Databricks facilitates iterative development, continuous integration and build. Current data management architectures are a complex combination of siloed, single-purpose tools. There are data lakes for low cost storage, but are difficult to use for data discovery, data warehouses that are reliable and optimized for fast queries, but come at a cost when having to scale, and various streaming and batch systems to shuffle data between them, often times resulting in data integrity issues. Businesses have to create a patchwork of different tools, skillsets, and expertise just to solve one fundamental problem: How can I make data-driven decisions faster? Join this webinar to learn how Databricks Delta — a new unified data management system — takes advantage of the the scale of a data lake, the reliability and performance of a data warehouse, and the low-latency updates of a streaming system, all in a unified and fully managed fashion. -How the need to process batch and streaming data creates challenges for enterprises with complex data architectures. -How Databricks Delta takes the best of data warehouses, data lakes and streaming systems to provide a highly scalable, performant, and reliable data management system. -A live demonstration of Databricks Delta to showcase how easy it is to cost-efficiently scale without impacting query performance. Machine learning has unlocked new possibilities that deliver significant business value. However most companies don’t have the resources to either build and maintain the supporting infrastructure or apply data science to build a smarter solution. A key obstacle for doing data engineering at scale is having a robust distributed infrastructure on which frameworks like Apache Spark can run efficiently. On top of building the infrastructure, having proper automatic functioning of the infrastructure is another critical piece for running production workloads. -Databricks’ automated infrastructure will allow you to autoscale compute and storage independently. -To significantly reduce cloud costs through cutting edge cluster management features. -To control certain features in the cluster management and balance between ease of use and manual control. CardinalCommerce was acquired by Visa earlier this year for its critical role in payments authentication. Through predictive analytics and machine learning, Cardinal measures performance and behavior of the entire authentication process across checkout, issuing and ecosystem partners to recommend actions, reduce fraud and drive frictionless digital commerce. With Databricks, CardinalCommerce simplified data engineering to improve the performance of their ETL pipeline by 200% while reducing operational costs significantly via automation, seamless integration with key technologies, and improved process efficiencies. Performance is often a key factor in choosing big data platforms. Over the past few years, Apache Spark has seen rapid adoption by enterprises, making it the de facto data processing engine for its performance and ease of use. Since starting the Spark project, our team at Databricks has been focusing on accelerating innovation by building the most performant and optimized Unified Analytics Platform for the cloud. Join Reynold Xin, Co-founder and Chief Architect of Databricks as he discusses the results of our benchmark (using TPC-DS industry standard requirements) comparing the Databricks Runtime (which includes Apache Spark and our DBIO accelerator module) with vanilla open source Spark in the cloud and how these performance gains can have a meaningful impact on your TCO for managing Spark. Differences between open source Spark and Databricks Runtime. Details on the benchmark including hardware configuration, dataset, etc. Summary of the benchmark results which reveal performance gains by up to 5x over open source Spark and other big data engines. A live demo comparing processing speeds of Databricks Runtime vs. open source Spark. Special Announcement: We will also announce an experimental feature as part of the webinar that aims at drastically speeding up your workloads even more. Be the first to see this feature in action. Register today! Databricks’ mission is to accelerate innovation for its customers by unifying Data Science, Engineering and Business. Founded by the team who created Apache Spark™, Databricks provides a Unified Analytics Platform for data science teams to collaborate with data engineering and lines of business to build data products. Users achieve faster time-to-value with Databricks by creating analytic workflows that go from ETL and interactive exploration to production. The company also makes it easier for its users to focus on their data by providing a fully managed, scalable, and secure cloud infrastructure that reduces operational complexity and total cost of ownership.